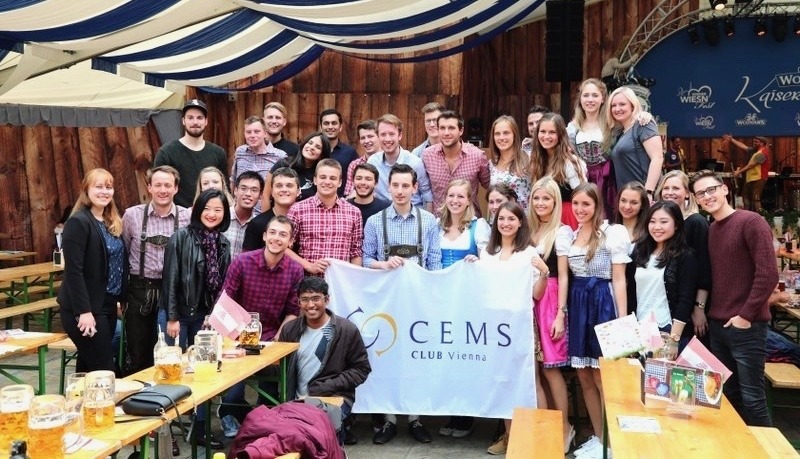 The CEMS Club Vienna (CCV) is a student association of international students studying MSc International Management & CEMS program at Wirtschaftsuniversität (WU) Wien in Vienna, Austria. CEMS is the Global Alliance in Management Education providing students of 30 academic institutions, one in each country, with world-class business education and developing future international leaders. The student’s cohort of the CEMS Master program at WU Wien is highly diverse, combining Austrian and foreign students from over 25 countries. Such diversity of cultures, personal backgrounds and professional experiences makes CEMS a truly unique Master program. In addition, excellent University infrastructure and inviting Viennese culture supports students with a successful integration in the country. CEMS Club Vienna is one of the most active CEMS clubs among participating Universities, which has been scoring high on the leadership dashboard of all CEMS student associations for many years. The Organization was initiated by Austrian CEMS students in 1999. 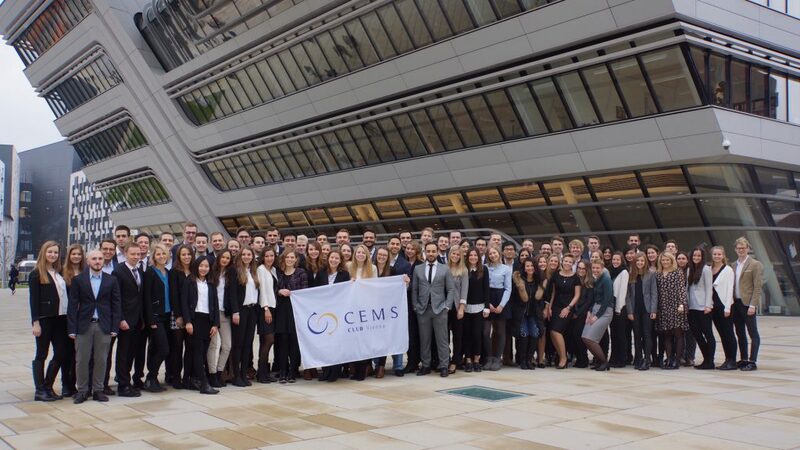 Due to the European CEMS board decision in 2000, every CEMS university is since then entitled to an opportunity to found a CEMS student association. CEMS Club Vienna is being run by approximately 50students with the support of CEMS WU Program Managers. As a networking platform, CEMS Club Vienna stands between 73 corporate partners and 7 social partners, CEMS Alumni and CEMS students (CEMSies), with the main goal to combine the academic program activities and various social and professional events that help shaping students’ personality and boost their professional competencies, essential to succeed in a competitive jobs market worldwide. CCV has its ownorganizational structure, with its President and functional bodies with their respective teams’ heads, elected every year or semester. Besides that, the national CEMS representatives are elected by their national fellow students. These representatives communicate students’ wishes to the CEMS board, so that to improve and keepCEMS students’ wellbeing and educational standards up in all CEMS Universities. The CCV represents all Austrian CEMS students on a national and international level. The activities involve decisions concerning the program content as well as organizing events with corporate partners, such as company presentations, workshops, rotation dinners etc. The main idea behind the organization is promoting innovation, sustainability and diversity among the students. As a result, various social and cultural events contribute to the club’s networking aim. Corporate team of CCV organizes more than10events, trainings and company visits throughout the semester,involving CEMS corporate partners, which are leading international companies operating across a wide variety of industries. These events provide students with a chance to get to know how the certain industry or a particular company functions, dive into company’s culture, network with company’s employees in semi-formal setting. All this allows students not only to find out whether the company and industry fits their desires, but also to get useful tips to pass the selection and interview process. Such events as “Excel-skills workshop” or “Case-cracking workshop” provide with practical skills that will help students straightaway when going through a job application process and in the first months on a new job. These kinds of events are free of charge for CEMS students; however, the participation is normally selection-based. Corporate Social Responsibility team, on the other hand, deals with a completely different side of CEMS students’ life. The team organizes and promotes different sustainability and social-support events, such as German language courses for refugees, held by students as well as cultural dinners to support newcomers’ integration in Austria. Additionally, the team actively involves CEMSies into activities to support people, lacking sufficient money, through cooking for them and collecting donations for various organizations through selling self-made products. Finally, CSR team educates CEMSies on global problems, such as climate change, waste pollution, sustainability importance and proposes actions in a game form (recent April’s week-long “Sustainability Challenge”) every student can integrate in their daily life to help improving the situation. CSR events raise responsible attitude within CEMS students and teach them to care about the local community and environment around them. Social Events teams organize a lot of different educational, cultural, sports and travel events. These events happen on weekly basis and bring a great CEMS community atmosphere to students’ daily lives. Since almost a half of the students come from all over the word, social events also create perfect setting for learning from each other about different cultures and languages. Austrian culture is playing a vital role in the organization of the students’ events. The Student Club is highly driven to acquaint foreign students with Austria and, particularly, Vienna. In summer, CCV organizes hiking trips, excursions around Vienna and visits to the Viennese Opera. During the winter time students are invited to spend a weekend in the Austrian mountains and enjoy breathtaking views while skiing or snowboarding. The signature event of CEMS Club Vienna has become ‘CEMS Waltzing Days’ which unites students from all over Europe who fly in to enjoy the infamous WU Ball.